Carpal tunnel syndrome is a common condition, which causes pain, numbness, and tingling in the hand. 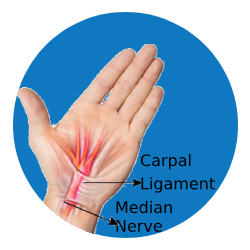 This occurs when one of the major nerves to the hand the median nerve is compressed as it travels through the wrist. Hand and wrist position: Doing activities that involve extreme flexion or extension of the hand and wrist for a prolonged period of time. Medical Conditions: Diabetes, Rheumatoid arthritis, and thyroid gland imbalance. Symptoms are more at night. Moving or shaking their hands helps in relieving their symptoms. Carpal tunnel release – Cutting the ligament that forms the roof of the tunnel to increase size of the tunnel, which relieves pressure on the median nerve.